This A.M. whether you pronounce it New Oar-lynns or Nah'lyns or New Or-leans, everyone will agree my New Orleans recipe produces super authentic, super delicious and super easy to make gumbo. Gumbo is a dish that originated in southern Louisiana during the 18th century. There are a few different varieties of gumbo. In New Orleans, what is known as Creole gumbo is usually made starting out with a French base made of flour and fat, known as a roux, then vegetables, which usually include celery, bell peppers and onion, are cooked down and then strong flavored stock and meat is added. The dish simmers, with shellfish and some spices added near the end and enjoyed with rice. 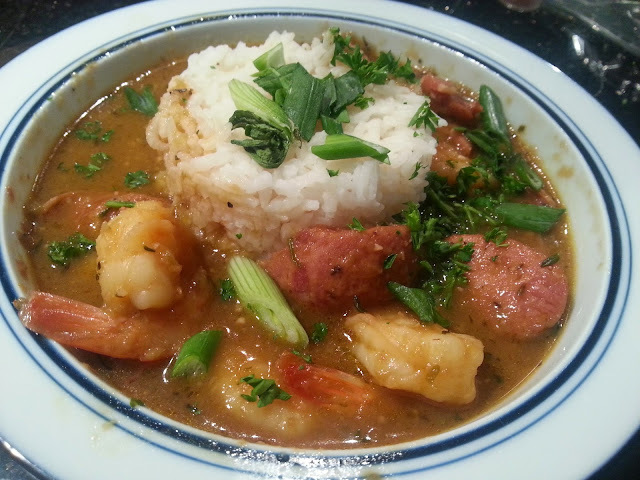 Gumbo is official cuisine of the state of Louisiana and now you can make it for your family with my easy to follow recipe. In a medium size pot or dutch oven, fry bacon until crispy. Remove bacon from pan, add in butter and melt. Add flour and stir constantly for 4-5 minutes until rue becomes milky brown in color. Next mix in onion, pepper and celery and saute until vegetables are soft, adding a little of the seafood stock if needed. Once veggies are nice and soft add in stock, spices and gravy master. Stir well to incorporate. Bring to a boil to thicken sauce, then reduce heat and let simmer for about 15 minutes, stirring occasionally. Dice up bacon and slice sausage at an angle. Remove bay leaf, add in shrimp, sausage and bacon and cover for 5-6 minutes until shrimp are pink. Serve with white rice, hot sauce and fresh parsley and green onion on top.